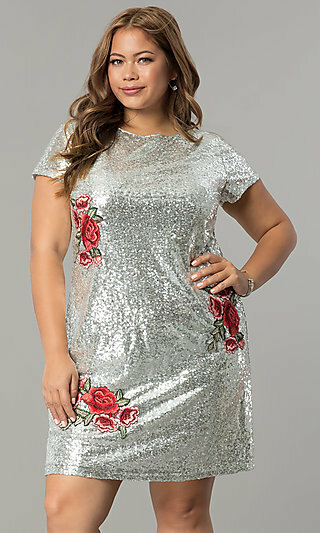 When you shop for plus size silver dresses at PromGirl, you will find dresses in silver and gray that are glamorously styled to steal the spotlight wherever you go. Our long silver formal plus-size gowns include long metallic strapless sweetheart dresses and charcoal gray v-neck ruched gowns that are fashion-perfection. Create a stunning silhouette on the dance floor in a long silver illusion chiffon dress that has an elegant sway as you twist and twirl. Turn up the glamour in a short plus-size designer dress with an elaborate array of silver sequins and beads or step out in a sleeveless v-neck illusion short beaded plus dress in silver and get ready for compliments. Give yourself a trendy look for a wedding-guest dress or short plus-size prom dress with a short silver party dress with a jewel-accented lace bodice and a gathered layered short tulle skirt. From long dresses to short dresses, PromGirl has a large selection of gorgeous silver dresses in plus sizes that will stand out from the crowd. Where Should I Wear a Silver Plus-Size Dress? Silver dresses and gray dresses are stylish and elegant for proms, cocktail and parties. Long silver dresses from PromGirl showcase your glamorous style at dance parties and galas. For a sparkling look, select a silver jeweled-illusion long chiffon formal plus-size gown with sheer sleeves or a long silver v-neck a-line dress with rhinestone detailing. Look as if you just stepped off the runway in a PromGirl gunmetal gray strapless sweetheart metallic gown. Our charcoal gray v-neck ruched long formal plus-size dresses are figure-flattering and gorgeous with sheer-lace on the back for a touch of elegance. The long chiffon plus dresses at PromGirl are delightfully styled to create glamorous looks as a long prom gowns or formal wedding-guest dresses. Short silver dresses will put on the ritz when worn as cocktail dresses and high-fashion semi-formal party dresses. Short silver glitter sheath plus-size dresses are styled right for holiday dresses and dinner party dresses. Show off your fun and flirty side in a silver fit-and-flare lace-bodice babydoll dress that has a romantically alluring back keyhole detail. These short silver designer plus dresses are on trend for special-occasion dresses and formal party dresses. Our collection of unique designer dresses includes sleeveless silver illusion v-neck plus-size dresses, short beaded cocktail dresses with three-quarter sleeves and short sequin plus-size shift dresses with exquisite designs in silver beads and sequins for breathtaking beauty. Wherever you decide to wear a plus size silver dress from PromGirl, you will showcase your unique style.